The Rhode Island Department of Transportation sealed a deal with autonomous vehicle developer May Mobility on Dec. 3 to pilot test a self-driving six-person shuttle bus service that will operate between the city of Providence and the town of Olneyville via the Woonasquatucket River corridor. 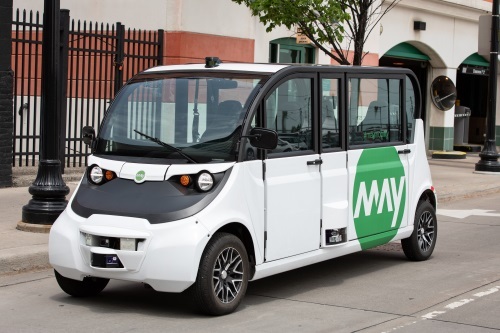 The agency said in a statement that these fully-electric autonomous shuttle buses – staffed with a human “attendant” who can take full control the vehicle at any time – will be free to the public for a year, starting in the late spring of 2019. RIDOT noted it will begin testing the vehicles over the winter months on low-volume, low-speed roadways in the Quonset Business Park in North Kingstown – home to some 12,000 workers – across a “range of factors” to better understand the potential of new technology to improve mobility options. Charles St. Martin, RIDOT’s chief of public affairs, told the AASHTO Journal by phone that this autonomous shuttle fills a “transportation gap” within the transit system between downtown providence and Olneyville. “Rather than re-deploy transit buses to serve the area, we’re using this as an opportunity to test this new technology,” he explained. St. Martin added that RIDOT and May Mobility plan to launch a public education campaign that includes placing signs along the self-driving shuttle bus route and using a dedicated website to help increase awareness about this new service and grow ridership. Under the terms of this public-private partnership, RIDOT said it will contribute $800,000 for the first year of operation; money that includes $300,000 of 100 percent federally funded research funds through the Federal Highway Administration and a $500,000 grant awarded by the Rhode Island Attorney General’s office as part of a settlement with Volkswagen for violating Rhode Island’s laws prohibiting the sale and leasing of diesel vehicles equipped with illegal and undisclosed emissions control defeat device software.